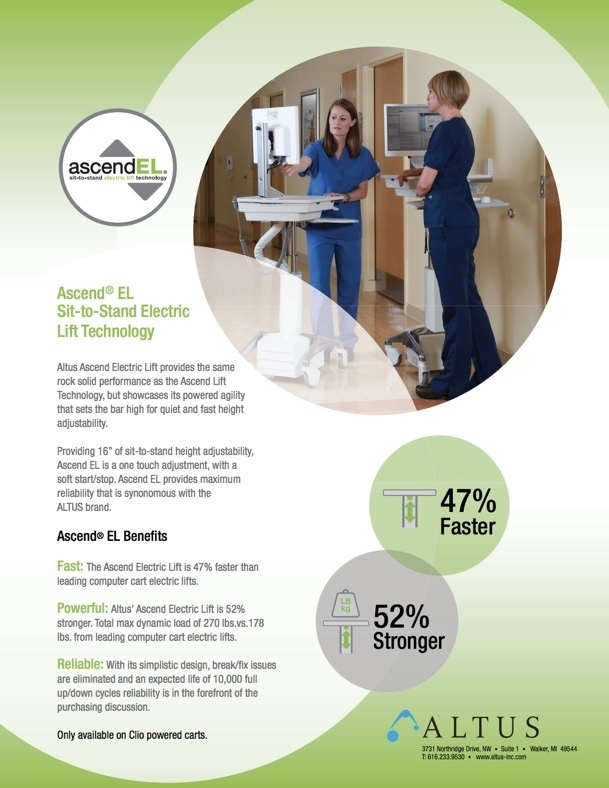 Download the Ascend EL Sell Sheet for all of the benefits! Altus Ascend Electric Lift provides the same rock-solid performance as the Ascend Lift technology but showcases its powered agility that sets the bar high for quiet and fast height adjustability. Providing 16” of sit-to-stand height adjustability, Ascend EL has a one-touch adjustment, with a soft start/stop. Ascend EL provides maximum reliability that is synonymous with the Altus brand. Altus’ mobile technology carts and wall-mounts offer both manual and electric lift systems. With one step height adjustment, you can place stations in an ideal ergonomic position. With little effort, you are provided flexibility to your workflow.